1. 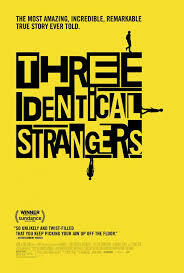 Interesting facts she guesses, 2. well done she guesses, 3. disheartening+ she knows, so in all Ciwt does not personally recommend Three Identical Strangers. But Rotten Tomatoes and audience critics do, so your choice.